Each step of the prison breakout was meticulously planned, including the four vicious murderers who were selected to escape. But the plan has gone wrong, and those four killers are now loose in London, each looking to carry out his own agenda. It's going to take Inspector Walter Day, Sergeant Nevil Hammersmith, and everyone else on Scotland Yard's Murder Squad working full-out to catch them all. What they don't know is how badly the deck is stacked against them. There are people amongst them who don't want the killers caught by Scotland Yard; one of the killers is heading straight for Day's home and his pregnant wife; and yet another of the killers has unleashed a plague upon the city: Jack the Ripper is alive and well... and walking the streets of London. Once again, Alex Grecian turns loose his formidable powers of description to bring Victorian London to eerie, bustling life. From the prologue that takes place in the underworld beneath the city streets, to the prison break, to the adrenaline-pumping chase scenes, I could see it all before me, and I have to admit that the hair was standing on the back of my neck over and over again. Secondary characters like the young boys used to deliver messages and drive the police wagons from place to place as well as the marvelous Eunice Pye and her garden hoe added so much depth to the story. Having known from the synopsis of the book that Jack the Ripper was involved, I expected blood and knife work, so those scenes did not surprise me. They also didn't seem gratuitous or over the top. But what of our heroes, Day and Hammersmith? Their relationship is progressing and right on the threshold of turning into something very special. We also get to see how Walter Day is responding to impending fatherhood, but the two are separated for much of the book. Dr. Kingsley and his daughter also play reduced roles, and these factors seriously weaken the story. In many ways, it felt almost as though there was a bit too much going on in the book. A secret society, Jack the Ripper, four other killers scattered around the city, Claire Day's pregnancy, Day going his way and Hammersmith in another... I got the distinct impression that Grecian was laying the foundation for future books in the series. 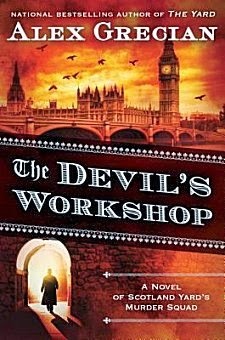 I love his writing-- the way he can set a scene and bring it to life, the atmosphere and the marvelous characters he creates-- but The Devil's Workshop was a bit hectic and unfocused. Still miles better than many other crime fiction novels available today, just not quite up to the standard Grecian set in The Yard and The Black Country. That said, I still highly recommend the entire series and am eagerly awaiting the next. Cathy - I was wondering about the violence quotient too, actually. I'm glad you didn't find it 'over the top.' And I know what you mean about a lot going on. Still, I love the historical setting. Might just have to give this series a try. The Yard has been reduced to $2.99. Download it and give it a try. I loved it!